One thing everyone who has ever planned a wedding says is the following: there are lots of unexpected things you will have to pay a lot of money for. One of them is the wedding centerpiece. You might not know it now, but when it is time for your wedding, the wedding centerpiece will be an unexpected toll on your budget. Therefore, I want to prepare you beforehand. Wedding centerpieces are an element not many people notice. Let’s be honest, after the first five minutes, nobody watches the bride and groom’s table. You start the party, and everyone goes to the dance floor. But for those five minutes when all eyes are on your table, you want a centerpiece that is worth looking at. The common standard for the centerpiece is a lots of flowers. But all those flowers can cost you a fortune. Today, I will give you several ideas that will not take a toll on your budget, but still give you a dream scenario wedding centerpiece. Think about this for a moment. 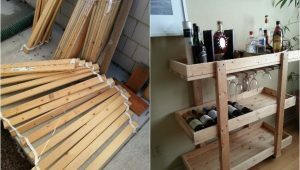 How many empty bottles you have at your home? Or let’s try it differently. How many bottles of wine you open per month? Do you throw away those bottles? Well, if your wedding is coming soon, save a bottle or two. 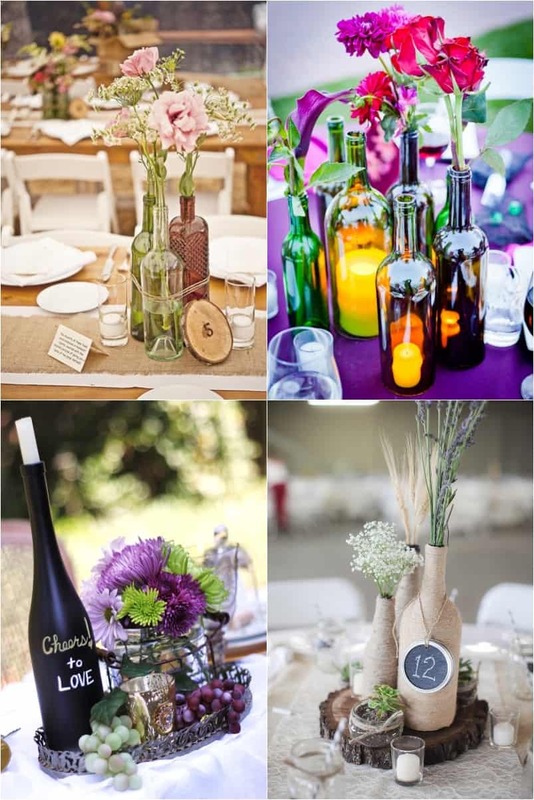 These bottles will come in handy when you are trying to decorate your wedding. You can make perfectly beautiful centerpieces with just a bottle and some fruits. This is probably the cheapest, yet extremely beautiful centerpiece. Balloons cost little to nothing. The only challenge is you need to blow the balloons. Now, if you cannot spare some breaths for your wedding, you have a problem. You will need a lot more breathing to get through the entire wedding. Pumpkins are one of those timeless decorations. Do not think pumpkins are good only for Thanksgiving and fall decorations. Because of its unique shape and size, a pumpkin makes a great and versatile decoration. Paint it, add a flower here and there, some candles, and you have a beautiful wedding centerpiece. When it comes to wedding centerpieces, the common standard is they need to be positioned on the table. But why not try something out of the ordinary? 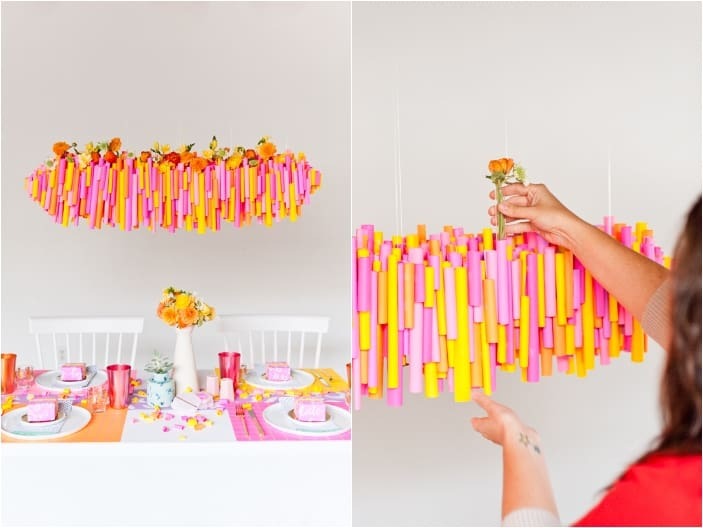 Think outside of the box, and you will end up with a hanging centerpiece. Given the fact hanging things are extremely popular recently, it is no surprise we get a hanging centerpiece. I am sure your guests will be amazed. If you are looking for cheap accessories for your wedding centerpiece, look no further than mason jars. Same as bottles before, I am sure many of you have some mason jars at home. And they are just standing around dusting. Find or buy some lace fabrics, and decorate your mason jars. 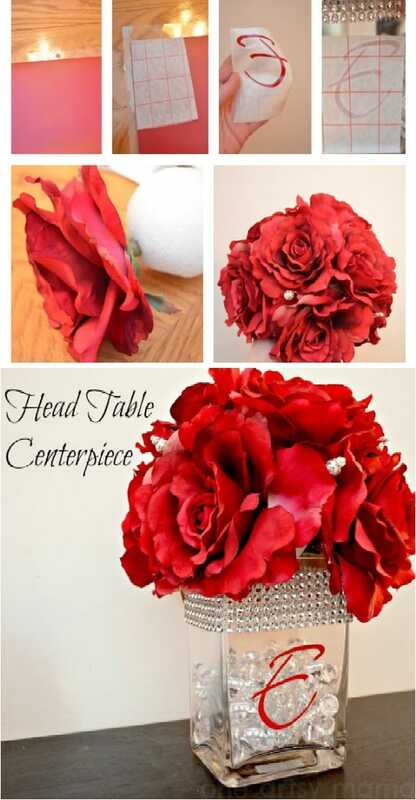 You will end up with a romantic centerpiece that will steal a lot of looks. I mentioned at the beginning that flowers are the gold standard for wedding centerpieces. But you do not have to but flowers. They can be extremely expensive. What you can do is paint some flowers on your own. 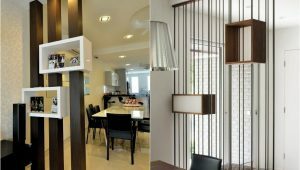 You will still get the colorful and lively decoration you always dreamed of. And you won’t have to spend a fortune to get it. Flower in sand, or any decoration in sand and bowl is probably one of the oldest tricks in the book. A timeless decoration that works wonders for any occasion. Now, you borrow the trick for your fairy tale wedding. Simple, yet elegant and beautiful. This is still essentially a flower centerpiece. The difference is the wooden box. You can use it to perfectly mix and match modern and old. The wooden box gives you a bit of rustic and traditional feel to your modern wedding. I must say, this is a centerpiece you have to plan for. I am fairly certain you do not have some shells flying around. But if you are into nautical topics, you can collect some shells from your holiday, and use them for the centerpiece. In the past few years, I’ve seen glass engravings taking over. Engraving on glass is becoming more and more popular. And with that in mind, I give you a glass monograph that will fit your wedding ceremony. We must have a floral centerpiece, right? Well, even with a flower centerpiece, the goal is not to spend a fortune. Believe me, you will have a lot of expenses you need to cover. 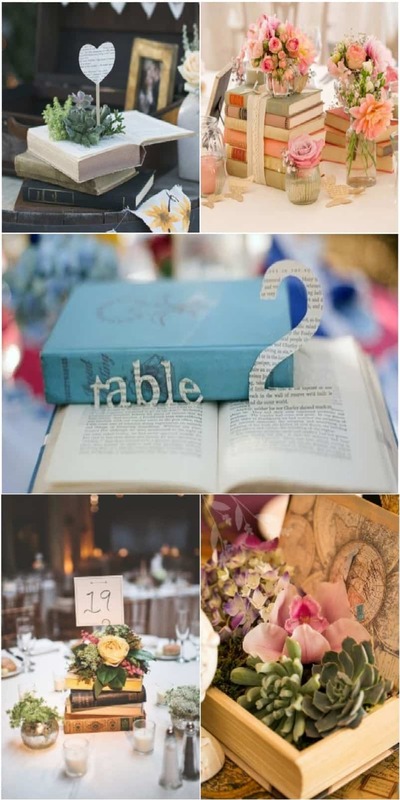 Therefore, use every trick in the book you can find to get a floral centerpiece that does not cost a lot. This is one of those tricks where you can use fewer flowers to make the centerpiece look richer. Less is more has been a rule for so many years. And in this case, with just few flowers, you can get a centerpiece that looks like you used a dozen of flowers. When it comes to decorations, books are always a good idea. 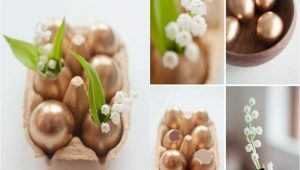 They add texture, size, and shape to the decoration. And because of their volume and size, you can use few books to get an extremely big centerpiece. Toss in some flowers, and you’ve got a big and rich centerpiece. 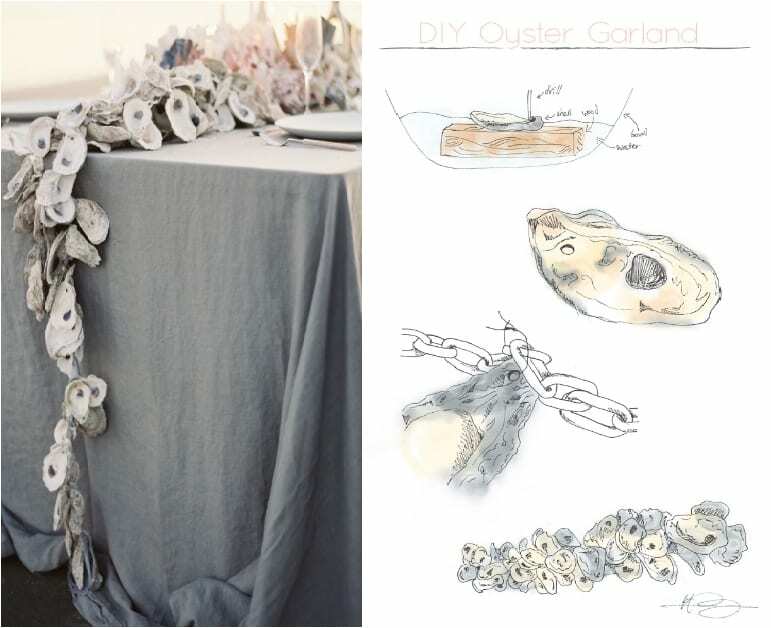 Creating a garland is always a nice idea. 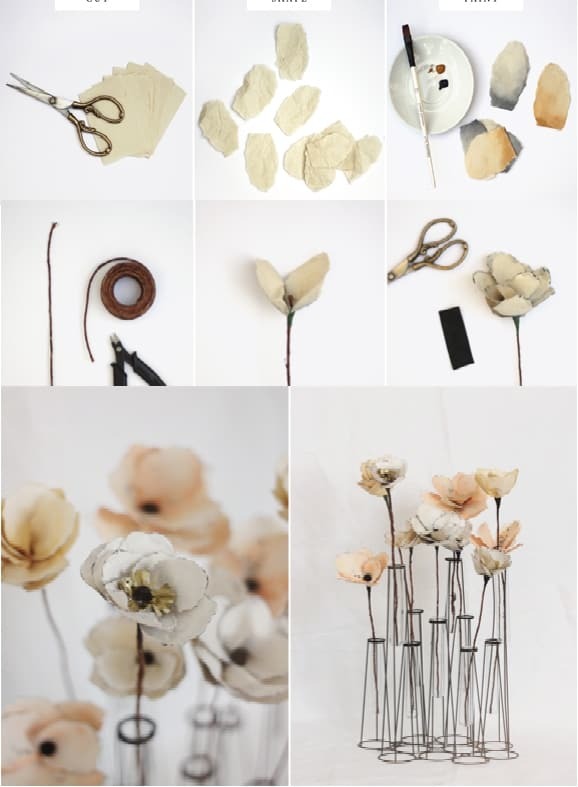 Originally made from flowers and leaves, you can add anything else you like. 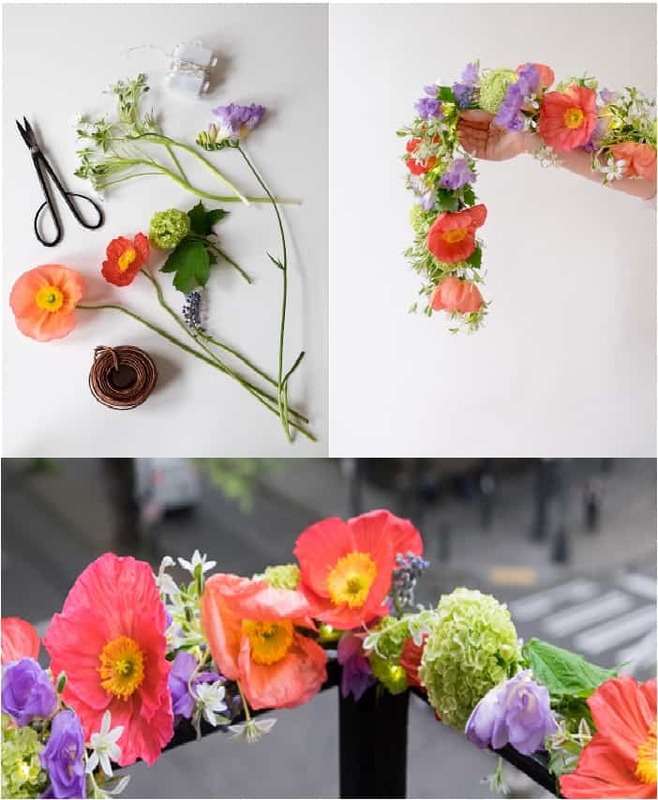 Just make sure to mix different colors flowers for a more whimsical look. I am sure few of you expect to see fruits at the wedding ceremony table. But citrus are so colorful and interesting, you just cannot ignore them. 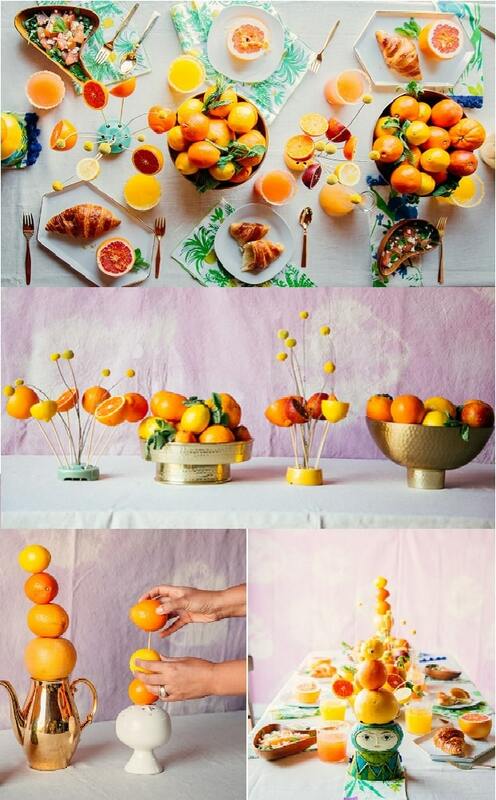 A citrus themed centerpiece is definitely out of the ordinary. But sometimes, that is exactly what you want and need. With that in mind, I leave you to consider some of the ideas. When it is time to plan your wedding, make sure to remember these ideas. And check some of the other wedding articles I’ve written. And for those of you that have gone through the whole wedding process, gives us some advice from experience.